A cousin of the cobbler, this dessert is served at the Four Swallows restaurant on Bainbridge Island, Washington. 1. To make crumb topping, combine ¼ cup flour, ¼ cup sugar, and the 2 tbsp. of chilled cubed butter in the bowl of a food processor and process until mixture takes on texture of coarse bread crumbs, about 10 seconds. Refrigerate for 30 minutes. 2. Heat oven to 350°. Grease eight 6 oz. ramekins with butter and dust with flour; set aside. In a medium bowl, whisk remaining flour, baking powder, and salt; set aside. In a large measuring cup, whisk together melted butter and wine; set aside. In a large bowl, whisk together remaining sugar, vanilla, and eggs until pale and thick, about 2 minutes. Add wine mixture to eggs and whisk until smooth. Add flour mixture; mix until just combined. 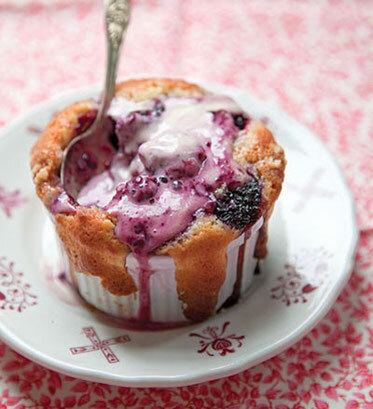 Divide batter between ramekins and top each with berries. Sprinkle reserved crumb topping evenly over berries. Put ramekins on a baking sheet and bake until golden brown and bubbly, about 1 hour. Transfer to a rack and let cool for 20 minutes; serve with scoops of ice cream on top.